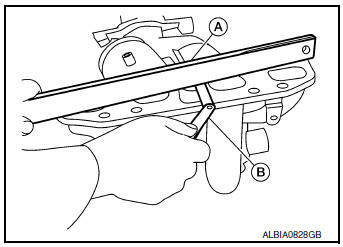 Remove A/C line bracket bolt (A). Remove engine under cover. Refer to EXT-37, "ENGINE UNDER COVER : Removal and Installation". Remove the oil level gauge and oil level gauge guide. Refer to EM-92, "Exploded View". Remove harness ground wire bolt from generator bracket. 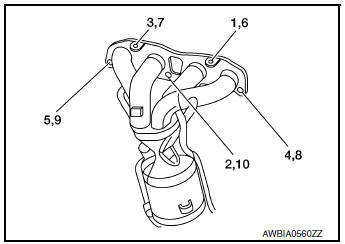 Disconnect harness connector from air fuel ratio (A/F) sensor 1. 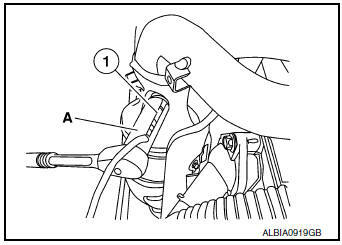 Remove the air fuel ratio (A/F) sensor 1 (1) using Tool (A), (if necessary). Be careful not to damage air fuel ratio (A/F) sensor. Discard any air fuel ratio (A/F) sensor which has been dropped from a height of more than 0.5 m (19.7 in) onto a hard surface such as a concrete floor; replace with a new one. Detach front exhaust tube from exhaust manifold and three way catalyst. Discard the gasket. Refer to EM-29, "Exploded View". Remove the exhaust manifold cover (upper). Loosen the exhaust manifold and three way catalyst nuts in the reverse order as shown. Remove exhaust manifold and three way catalyst. Remove the exhaust manifold cover (lower front) (if necessary).
. Remove the exhaust manifold cover (lower rear) (if necessary). 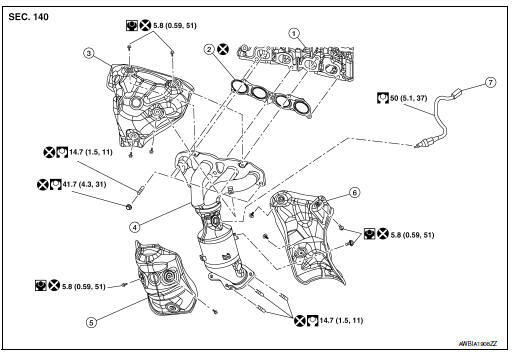 Check the flatness of exhaust manifold and three way catalyst using suitable tools (A/B). NOTE: Place the suitable tool (A) diagonally and measure in several locations. Do not reuse an exhaust manifold cover which has been dropped. Be careful not to deform exhaust manifold covers. Install studs in cylinder head studs and exhaust manifold and three way catalyst (if removed). Then tighten to specification. CAUTION: Do not reuse cylinder head or exhaust manifold studs. Install the exhaust manifold and exhaust manifold and three way catalyst gasket. Then tighten the nuts to specification in the numerical order shown. CAUTION: Do not reuse exhaust manifold and three way catalyst gasket. 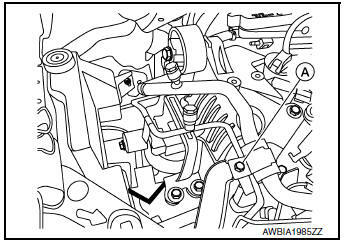 Install the air fuel ratio (A/F) sensor 1 (1) using Tool (A) and tighten to specification. Do not over-tighten the air fuel ratio (A/F) sensor 1. Doing so may cause damage to the air fuel ratio (A/F) sensor 1, resulting in a malfunction and the MIL coming on.